South Sudan’s exiled former vice president and opposition leader says he’ll reluctantly take his movement back to all-out war if a peace deal with the government cannot be restored. Rieck Machar, the leader of the Sudan People Liberation Movement in Opposition (SPLM-IO), told VOA in an exclusive interview Thursday that his movement is reorganizing itself to stage what he called a popular armed resistance against the government of President Salva Kiir. At the same time, he said he wants to revive the August 2015 peace deal between the SPLM-IO and the government. He said the “troika" of countries that backed the peace deal – the United States, Britain and Norway – should call for an urgent meeting of South Sudanese political parties to address the country's political instability and ongoing conflict. Machar spoke to VOA's “South Sudan in Focus” program by phone from South Africa, where he flew this week to seek unspecified medical treatment. The former vice president fled the capital, Juba, in July during clashes between government and opposition forces that killed some 300 people. He said 70 of his fighters were killed by the South Sudan army as he and his fighters made their way to the neighboring Democratic Republic of Congo. 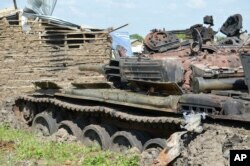 FILE - Tanks destroyed during fighting between forces of Salva Kiir and Riek Machar in Jabel area of Juba, South Sudan, July 16, 2016. Machar said throughout his journey to Congo, he was constantly contacting Kiir in a bid to end the fighting, which erupted at the presidential palace and later engulfed Juba town. He said he could not continue communicating with Kiir while being pursued by members of the South Sudanese air force and infantry. “I decided to withdraw to a country [where] I will be secured in and then find a way of having that meeting with President Salva,” Machar said. After Machar fled the capital in July, United Nations aid agencies reported fighting in Western Equatoria state, where thousands of families were displaced from their homes. Local chiefs in the area told VOA reporters that the South Sudan Army ransacked villages, beating anyone they found in the villages around Mundri and Amadi. At the time, Machar was still South Sudan's first vice president. Machar and about 750 of his fighters were evacuated in late July from the South Sudan border by U.N. peacekeepers in the DRC. He and a few of his soldiers were then flown to Sudan's capital, Khartoum for medical treatment in August. Following the fighting in Juba, Kiir accused Machar of wanting to kill him and overthrow the transitional Government of National Unity. He told the Kenya Television Network that Machar had a pistol during an early July meeting at J1, the South Sudanese presidential palace. A government source said fighting at the presidential palace was kindled by Machar’s spokesman in Nairobi through a July 8 Facebook post, saying that Kiir had arrested Machar in the palace and Kiir’s men were planning to kill the vice president. 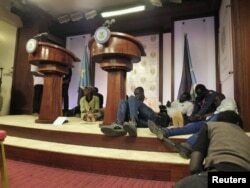 FILE - Journalists are seen on the podium following sounds of gunshots before a news conference by South Sudan President Salva Kiir, First Vice President Riek Machar and other government officials inside the Presidential State House in Juba, South Sudan, July 8, 2016. Machar and Kiir appeared visibly shaken during a July 7 address to the nation carried by South Sudan Broadcasting Corp. The two leaders told South Sudanese that they did not know the cause of the fighting between Machar’s bodyguards and South Sudan presidential guards. Members of Machar’s party dismissed the government’s version of the fighting’s source. According to Machar, Kiir misled the Kenyan journalist. Machar said he was discussing pressing issues when fighting suddenly erupted outside the presidential palace in July. 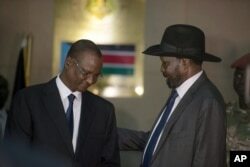 He added that there would be no peace in South Sudan until the resolution of issues such reforms in government institutions, cantonment areas for his troops, and Kiir’s controversial plan to create 28 states. Machar met with officials of his SPLM in Opposition party in September in Khartoum and issued a statement declaring war on the transitional government. He said groups opposed to Kiir’s leadership are fighting all over the country, including in the former Central Equatoria state, Western Equatoria, Eastern Equatoria and Bahr El Ghazal. The United States, Britain and Norway – donor countries supporting South Sudan – have voiced concerns about Machar's declaration of war. The three issued a statement in October asking that he seek peaceful means to ending South Sudan’s conflict. Machar said the three countries have ignored the real problem in South Sudan and are focusing on prescription rather than the symptoms. He said his forces have been under constant attack from the South Sudan army since he signed the August peace deal. He said he met Ugandan President Yoweri Museveni in Khartoum on Wednesday and they discussed the need for a political solution. He also said he assured Museveni about the readiness of SPLM-IO members to engage in dialogue with Kiir. Machar said he met with Ugandan President Yoweri Museveni in Khartoum on Wednesday, and they discussed the need for a political solution in South Sudan. He said he assured Museveni about the readiness of members of the SPLM-IO to engage in dialogue with Kiir. Kiir appointed Taban Deng Gai as the country’s new first vice president after Machar fled Juba in July. Machar said the appointment of Taban will not bring peace to the country. He called Taban an accomplice. FILE - South Sudan's First Vice President Taban Deng Gai, left, speaks with President Salva Kiir after Taban was sworn in, replacing opposition leader Riek Machar, at the presidential palace in Juba, South Sudan, July 26, 2016. Machar said Deng was angry because he did not get the position of minister of petroleum in the transitional government. Instead, Machar said he appointed Deng as minister of mining. After the July fighting in Juba, Machar said he consulted members of the SPLM-IO and fired Deng from the party. Machar said he wrote a letter to Kiir informing him of Deng’s dismissal from the party. Machar said he will not return to Juba if there are no efforts to end the political impasse in the country.